This is the winter-blooming clematis I posted about on December 2 when I realized it had a bunch of buds for the first time. Check out my earlier post to find out more about C. napaulensis. I have been waiting to see it put on a show for seven years! Twice it’s pushed out a flower or two, but now a plethora of small delicate blooms are definitely strutting their stuff in a gloomy and cold Seattle January. In mid-January Clematis napaulensis begins to roll up its delicate tepals to provide a first peak at the purple stamens. Two weeks later, stamens are dancing in the wind. The plant has at least 40 blooms! Maybe more–I can’t tell for sure how many are blooming high on the arbor. A close-up from yesterday. Two small intricate blooms that can knock your socks off in the middle of winter! If you are in Zone 8 (maybe Zone 7) or warmer, give this plant a try! My Clematis napaulensis, a species clematis that is one of the few winter bloomers in the genus, is loaded with flower buds! WAHOOO! This plant is wintergreen rather than evergreen, pushing out fresh new apple green leaves in October, then blooming in January and February. By summer it looks exactly like dead sticks, so masking it with a summer-blooming vine is wise. A small branch loaded with buds. Most of the rest of the vines are too high up on the arbor to get a good photo without dragging out the orchard ladder. C. napaulensis has graced the arbor on the north side of my house for about seven years now. During that time this recalcitrant plant has bloomed only twice with just two or three flowers, once in January 2015 and again in 2017. I’ve often wondered whether it’s in too much shade, but unfortunately not much information is available about what conditions this plant really wants. Ah, but, lo and behold, now in late 2018–tons of buds! I am so excited! I can hardly wait til they open in January! The blooms from 2017. C. napaulensis is a gorgeous winter bloomer with creamy petals that roll up to show off the long purple stamens. I hear tell that it’s also fragrant! C. cirrhosa ‘Freckles’, a reliable winter bloomer in my garden, started showing off about a month ago. Actually, it blooms sporadically throughout the year, but really begins to swagger this time of year. Looking carefully at the flowers, one can easily tell that C. ‘Freckles’ and C. napaulensis are kissing cousins! With its crisp green leaves and lovely red-spotted blossoms, C. ‘Freckles’ is particularly beautiful dangling down from a deciduous tree or shrub. Heartening to see fresh new flowers when most of the others have begun their long winter slumber. Clematis ‘Buckland Beauty’–beautiful bell flowers inherited from Clematis texensis. 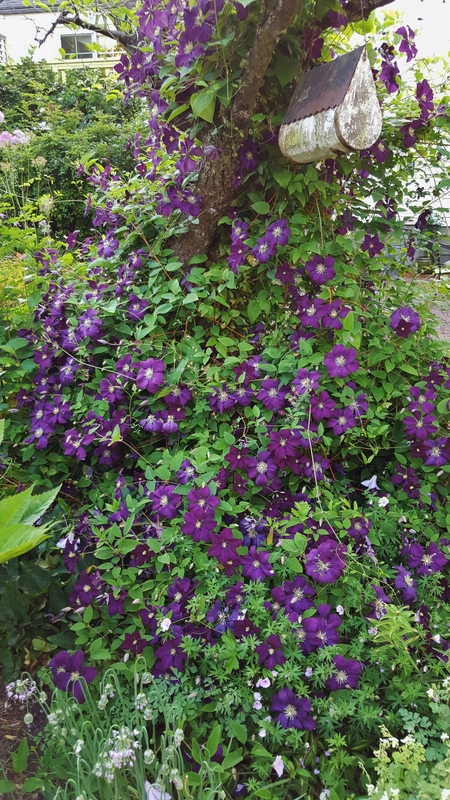 Gardeners who have a nodding acquaintance with clematis are often only aware of the big beautiful heart-stopping, jaw-dropping blossoms of late spring. As one becomes more and more enamored with clematis and delves deeper into the genus, the dainty beauty and wide variety of the bell-shaped flowers are the ones that captivate. The southeastern US is a breeding ground for many bell-flowered clematis species, which have long been widely used by hybridizers to create lovely new plants. Clematis ‘Buckland Beauty’ above, for example, is the result of a cross between Clematis texensis (a red bell-flowered species from Texas) and one of the other species. In my last post, I described Clematis texensis and some of its progeny. The species, which grows in Texas, is variable. The flowers tend to have a downward-facing bell shape, usually with recurved tips, sometimes lined with white or yellow. The inside of the tepals can be various shades of red, yellow, or white. Here’s another, a bit pinker with a shorter flower. Hybridizers discovered the wonderful red of Clematis texensis (also called the Scarlet Clematis) in the late 1800s, and still today exciting new hybrids come onto the market. 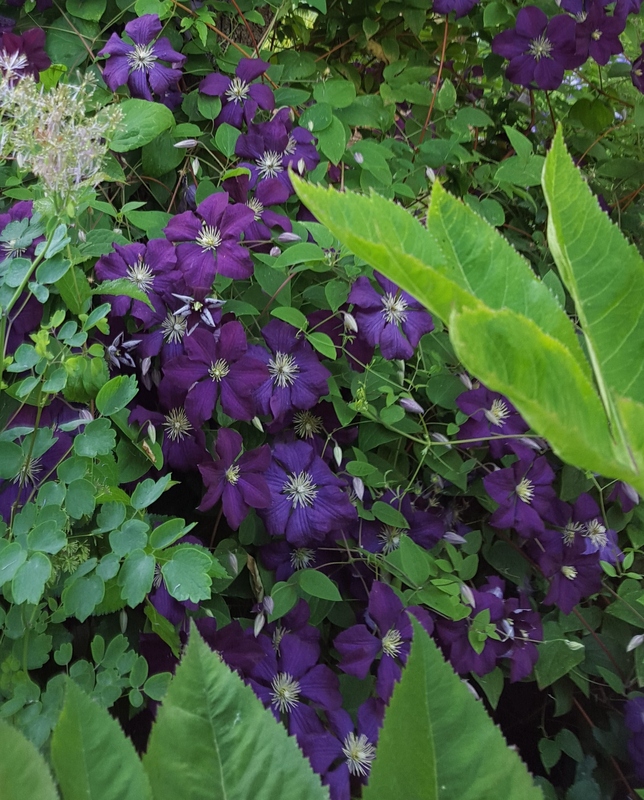 Crossing Clematis texensis with other types of clematis has resulted in an astonishing variety of new and beautiful plants, such as flatter blossoms of Clematis ‘Ville de Lyon’ and Clematis ‘Catherine Clanwilliam’ showcased in my last post. Of course, many of the progeny have bell-shaped blossoms, like the aforementioned Clematis ‘Buckland Beauty’ and the following lovely offspring of this interesting species. Clematis Sonnette climbing through a variegated Azara. Clematis ‘Duchess of Albany’, hybridized using C. texensis 125 years ago! Clematis Princess Kate ‘Zoprika’, one of the newest texensis hybrids coming from J. van Zoest Nursery in The Netherlands. Photo from J. van Zoest Nursery. Clematis crispa is another American species, native in the southeastern US. This sweet small bell flower often has tepals that curl strongly back on themselves. It comes in many soft colors–white, light blue, mauve, pink. The crowning glory for this clematis is its beautiful light fragrance. Clematis ‘Betty Corning’, discovered growing in a garden in Albany, is clearly a Clematis crispa seedling, especially given its delightful fragrance. Clematis ‘Princess Red’ certainly looks to be a Clematis crispa hybrid, but the color suggests that Clematis texensis might be the other parent! Clematis viorna, like C. crispa and C. texensis, is one of over 20 species that are native to the southeastern US and Texas, which are all grouped together in the viorna section of the genus clematis. 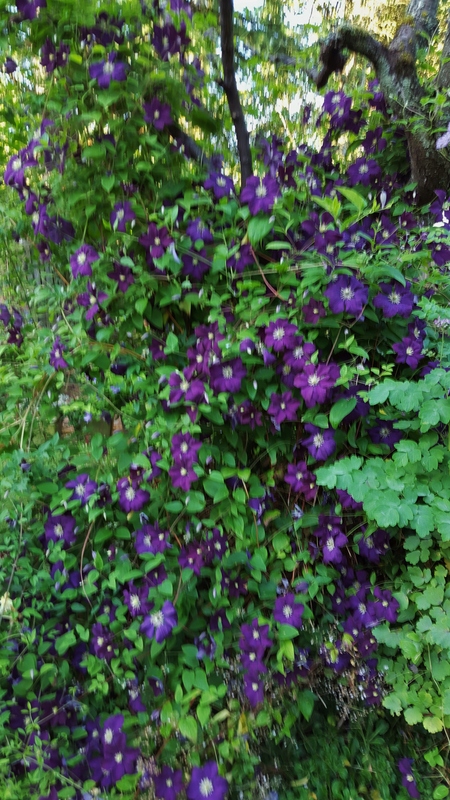 Clematis viorna is just one of the many clematis in the viorna section. It has flowers in the shape of small bells or urns that come in colors like red, pink, reddish brown, and purple. Many plants sold as the species may actually be hybrids of Clematis viorna and another clematis in the larger viorna clan. One of my two Clematis viorna. This one pairs beautifully with Beauty Berry! 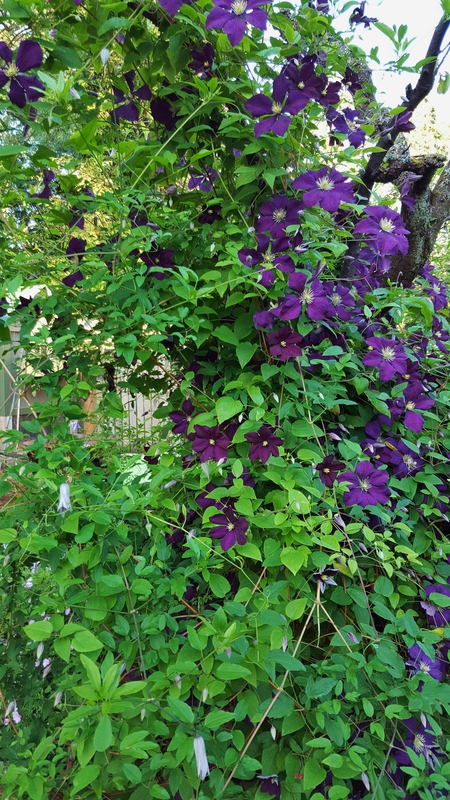 Many interesting clematis with bell-shaped flowers have been coming out of Japan for many years. Joy Creek Nursery is a good source for Japanese clematis. Below are three examples. The fragrant Clematis Kahori no Kimi–perhaps Clematis crispa is a parent? Clematis Hakuji–another Clematis crispa descendent? 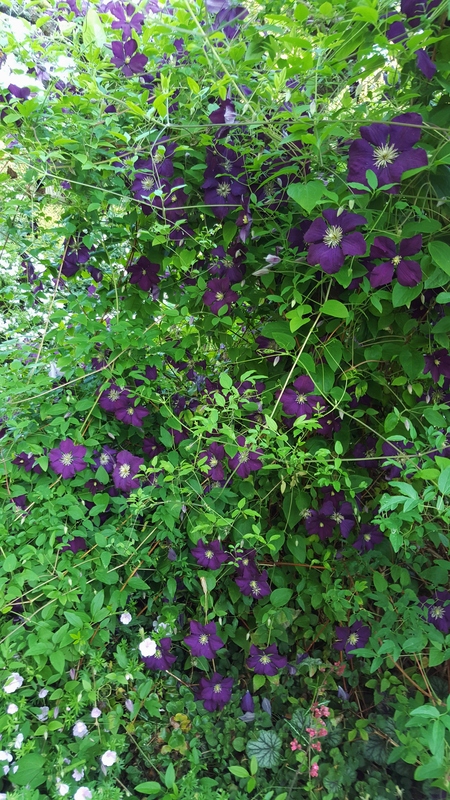 Clematis Shizuku–looking a little viorna-like? The best sources I’ve found for bell flowers are Brushwood Nursery and Joy Creek Nursery. So, come on–get one of these dainty-blossomed clematis for your very own!